Linda Rottenberg has changed the world, and she wants to show you how. What others thought about "Crazy Is a Compliment"
These days taking chances isn't just for college dropouts in hoodies. Whether you work at a Fortune 500 company, a nonprofit, or a mom-and-pop, everybody needs to think and act like an entrepreneur. We all need to be nimble, adaptive, daring -- and maybe even a little crazy -- or risk being left behind. But how do you take smart risks without risking it all? That's Linda Rottenberg's expertise. As the cofounder and CEO of Endeavor, the world's leading organization dedicated to supporting fast-growing entrepreneurs, she's spent the last two decades helping innovators think bold and execute smart. Now Rottenberg draws on her unrivaled experience to show you the proven techniques to achieve your dreams: from overcoming fear to facing down critics, from stalking supporters to exploiting chaos. 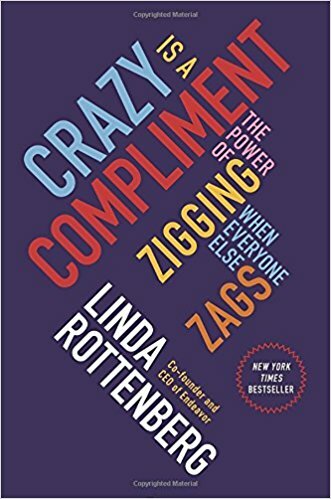 Crazy is a Compliment combines inspiring stories, original research, and practical advice to create a road map for getting started and going bigger. Every day I meet people with a dream. Maybe you're serving coffee and fantasizing about launching a microbrewery; maybe you've skipped college and yearn to start your own design firm; maybe you're sitting in your cubicle and brainstorming a new idea that can improve your company. You have a dream, but you don't know how to turno your dream into reality. Or you've already launched your dream but you're unsure how to take it to the next level. This book can show you the way.